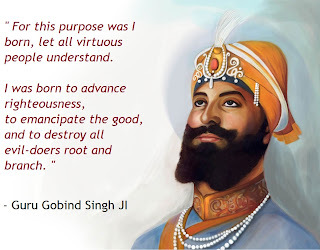 Guru Gobind Singh Ji (1666 -1708) was the Tenth of the Eleven Sikh Gurus. Born in Patna, Bihar in India, he was also a Warrior, Poet and Philosopher. His life was full of courage, valour, wisdom, sacrifice and devotion. He fought for the helpless and against injustice of the people of his time. The Divine brilliance shining through him, he was a lamp of wisdom who lit thousands of ignorant hearts and guided them to live a virtuous life. Through his poetry he preached love and equality and a strictly ethical and moral code of conduct. He preached the worship of the One Supreme Being, deprecating idolatry and superstitious beliefs and observances. The glorification of the sword itself which he eulogized as Bhagauti was to secure fulfilment of God's justice. The sword was never meant as a symbol of aggression, and it was never to be used for self-aggrandizement. It was the emblem of manliness and self-respect and was to be used only in self-defence, as a last resort. Guru Gobind Singh, the last of the living Sikh Gurus, initiated the Sikh Khalsa in 1699, passing the Guruship of the Sikhs to the Eleventh and Eternal Guru of the Sikhs, the Guru Granth Sahib. Guru Granth Sahib is a collection of hymns(shabad) or baani describing the qualities of God and why one should meditate on God's name.Guru Gobind Singh affirmed the sacred text Adi Granth as his successor, elevating it to Guru Granth Sahib. Khalsa is the collective body of Singhs and Kaurs. A Sikh who has been initiated into the Khalsa is titled Singh (males)/Kaur (females) and commonly referred to as "Amritdhari". The meaning of Khalsa translates to "Sovereign/Free". Another interpretation is that of being 'Pure'. In 1699, the Guru sent hukmanamas (letters of authority) to his followers, requesting them to congregate at Anandpur on 13 April 1699, the day of Vaisakhi (the annual harvest festival). He first asked everyone who he was for them? Everyone answered - "You are our Guru." He then asked them who were they, to which everyone replied - "We are your Sikhs." Having reminded them of this relationship, He then said that today the Guru needs something from his Sikhs. Everyone said, "Hukum Karo, Sache Patshah" (Order us, True Lord). Then drawing his sword he asked for a volunteer who was willing to sacrifice his head. No one answered his first call, nor the second call, but on the third invitation, Daya Ram (later known as Bhai Daya Singh) came forward and offered his head to the Guru. Guru Gobind Rai took the volunteer inside the tent. The Guru returned to the crowd with blood dripping from his sword. He then demanded another head. One more volunteer came forward, and entered the tent with him. The Guru again emerged with blood on his sword. This happened three more times. Then the five volunteers came out of the tent in new clothing unharmed. 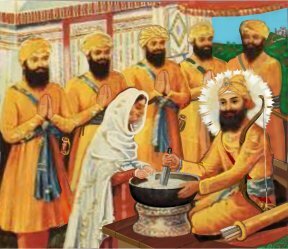 Guru Gobind Singh then poured clear water into an iron bowl and adding Patashas (Punjabi sweeteners) into it, he stirred it with double-edged sword accompanied with recitations from Adi Granth. He called this mixture of sweetened water and iron as Amrit("nectar") and administered it to the five men. These five, who willingly volunteered to sacrifice their lives for their Guru, were given the title of the Panj Pyare ("the five beloved ones") by their Guru. They were the first (baptized) Sikhs of the Khalsa: Daya Ram, Dharam Das, Himmat Rai, Mohkam Chand, and Sahib Chand. 'Waheguru ji ka Khalsa, Waheguru ji Ki Fateh' (Khalsa belongs to God; victory belongs to God). 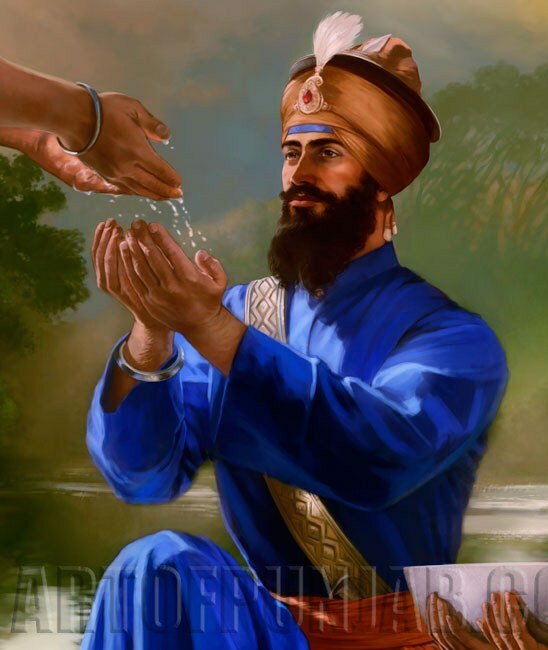 He gave them all the name "Singh" (lion), and designated them collectively as the Khalsa, the body of baptized Sikhs. The Guru then astounded the five and the whole assembly as he knelt and asked them to in turn initiate him as a member, on an equal footing with them in the Khalsa, thus becoming the sixth member of the new order. 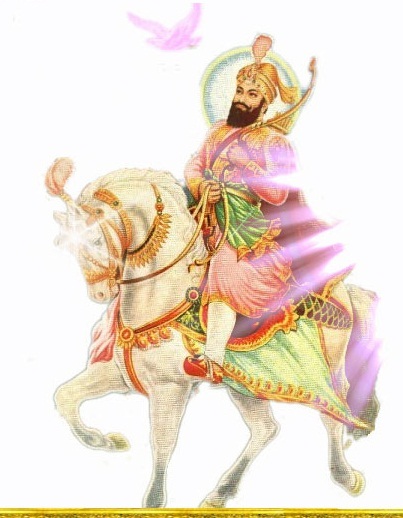 His name became Gobind Singh. Women were also initiated into the Khalsa, and given the title of Kaur("princess"). The Sikhs of the Khalsa can be identified with the given Five Ks and titles Singh and Kaur. This happens after being baptised to the order of the Khalsa. Five K are not merely symbols but commitment to the faith and philosophy of Guru Nanak, Sikhism, and collectively form the external visible symbols; hence clearly and outwardly advertising and displaying one's commitment. It is as much analogous to the uniform of an organization, especially a Military. Kesh: (uncut hair) A Sikh is to maintain and adorn this natural God-given gift. To work with nature and not against it. The Kesh was covered with aturban, Keski or Chunni to keep it clean and manageable. Kanga:(wooden comb) for the maintenance and ongoing upkeep of Kesh. A reminder to regularly maintain the body and mind in a clean and healthy state. Kara: (steel bracelet or slave bangle): Symbolises an unbreakable bond with God. It is a constant reminder that the Sikh is a slave of the Lord. He or she must only do His work in accordance with the Holy Scripture; to abstain for wrong-doing at all times. Kachhera: (cotton underwear) Standard, Naturally Comfortable, dignified attire reflective of modesty and control. A sign of a soldier; ever ready; dignified and highly mobile. Kirpan: (a small sword) A sign that a Sikh is a soldier in "Akal Purakh's (God's) Army" (Akal Purakh de fauj); to maintain and protect the weak and needy and for self defence. Never to be used in anger. It means "soldier like saint" rather than a "saint like soldier". Guru Gobind Singh Ji infused the spirit of both sainthood and soldier in the minds and hearts of his followers to fight oppression in order to restore justice, peace, righteousness (Dharma) and to uplift the down-trodden people in this world. "Without the support of the One Name, Consider all religious ceremonies superstitions." "God has no marks, no colour, no caste, and no ancestors, No form, no complexion, no outline, no costume and is indescribable. He is fearless, luminous and measureless in might. He is the king of kings, the Lord of the prophets. He is the sovereign of the universe, gods, men and demons. The woods and dales sing the indescribable. "Karta (The Creator) and Karim (The beneficient) are the names of the same God. Razak (The provider) and Rahim (The merciful) are also the names given to Him. Let no man in his error wrangle over differences in names. Worship the One God who is the Lord of all. Know that his form is one and He is the One light diffused in all." "The Khalsa is my own image. I shall always manifest myself in the Khalsa. The Khalsa is my body and soul; The Khalsa is the life of my life. The Khalsa is my perfect leader. The Khalsa is my brave friend. I say nothing untrue and to this; Guru Nanak, united with God, is my witness." "Why impress false religion on the world? It will be of no service to it. Why run about for the sake of wealth? You cannot escape from death. Son, Wife, friends, disciples, companions none of those will bear witness for thee. Think, O think, you thoughtless fool, you shall have in the end to depart alone."